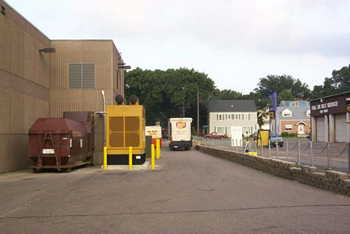 Figure 1 - EnGen site depicting building and retaining wall/property line proximity. A major food retail chain wanted to participate in cost savings derived from utilities sponsored "load shedding/peak shavings" programs. 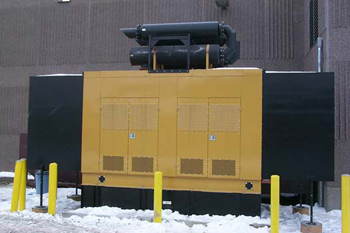 The concept was further enhanced by having a reliable power source on each store site, for emergency outages. 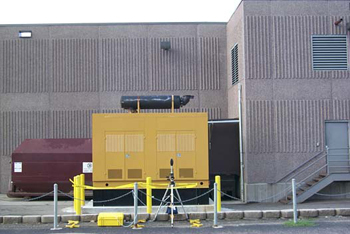 Figure 2 - EnGen weather housing before aeroacoustic modifications with ambient noise monitoring at property line. Phase 2: Design, fabricate and install requisite noise suppression hardware to achieve regulatory compliance, meet EnGen manufacturer's aerodynamic requirements and all within financial budget contraints of the EPG site. 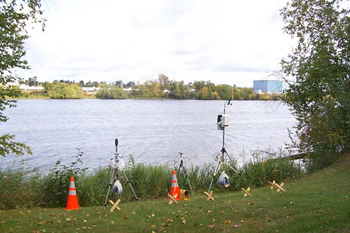 Figure 3 - Typical rural test site monitoring acoustics, GPS location and weather data. To accomplish Phase 1, our engineers instrumented the property line nearest the EnGen with acoustic and climatic data logging systems. Rural test sites (Reference Figure 3) would have included a global positioning satellite (GPS) system for accurate position location(s) verification and/or future predictive computer simulations. After 15 continuous test hours, with the EnGen locked off, data revealed the sites defacto acoustic ambient (LAeq) was 68.2 dBA without the EnGen running! To accomplish Phase 2, our engineers, armed with the data obtained in Phase 1, initiated the design of a noise abatement system to meet the acoustical, physical and financial constraints imposed by the EnGen site location. Three dimensional (3D), acoustic computer simulations automatically selected the material types and configurations while a computational fluid dynamics (CFD) computer routine monitored system aerodynamics. Both an acoustic and aerodynamic summary is attached with each generic system assembly candidate for the optimum EnGen site performance selection. When an aeroacoustic remediation configuration has been selected and topographically site adapted, the computer program will generate a shop ready, complete bill of materials (digital production file) ready for fabrication. This drastic reduction of engineering hours from concept to construction makes custom designs, with optimized aeroacoustic performances, much more convenient and cost effective than "off-the-shelf" hardware that sacrifices system performance for pseudo inventory of system mis-matched packages. Figure 4 - Noise abated configuration depicting inlet and discharge silencer banks, secondary exhaust mufflers and modified weather housing for enhanced aerodynamics. If you have an existing noise problem that requires rehabilitation or are embarking on a proposed project with an acoustic criteria, contact us for assistance starting with a free telephone consultation. From engineering services to noise abatement systems and aerodynamics through system installation, select any or all from our "aeroacoustic supermarket". Just give us a call and let a qualified engineer assist you to establish an effective, guaranteed solution. Tell us about your noisy problems, then let our almost 40 years of experience with noise make your job easier.